My Acer Liquid got wet with sea water. I didn't notice that right the moment, but after an hour it made a couple of vibrations and the screen doesn't turn on. Connected to power and nothing happens, no led lights and it does just nothing. Trying to turn it on doesn't give any result. Is it gone forever? Can I try anything? Can I make it repair? Even though this may not be the place to ask this question, you deserve some help with this one. The information below will help, but there is now additional information on rice baths and using water vs. alcohol to clean electronics. Please read more from iFixit for more detailed information. Separate the phone into as many parts as you can (i.e. take the battery out, back cover off) without taking screws out. Cover the device fully with dry rice. Try three days, this gives the water time to evaporate, hopefully aided by the rice. Reassemble and try the device again. next, submerge the phone (without the battery) completely in deionized water (distilled should be fine). Leave it there for 24 hours. ALTERNATIVELY: washing the internals with 90% or higher isopropyl alcohol will clean the device just as well, and evaporate much quicker, without the need for a rice soak. It sounds like you're screwed at this point. Immediately remove all battery and power sources and do not reconnect them for several days and after following the steps below. If the exposure is quite high. (ie submerged in salt water for several seconds), then you will want to flush the device with distilled water. OR if possible, disassemble and clean all electric surfaces with alcohol. Only when confident the device is dry, should you reapply power. The hope here is that when it shorted out the first time, it didn't damage anything. Attempting to apply the power while device is still wet will certainly cause damage. Rice does not solve water damage. When we put a phone in rice, it is the same thing as doing nothing. It just FEELS like we're actively trying something. Corrosion is instant when a phone hits water. Sometimes the corrosion hits important components, sometimes not. If we resist turning the phone on until it dries on the counter, in the rice bag, or anywhere else, sometimes we get lucky. If we had the phone in the rice bag, we think the rice saved the phone. But it didn't! 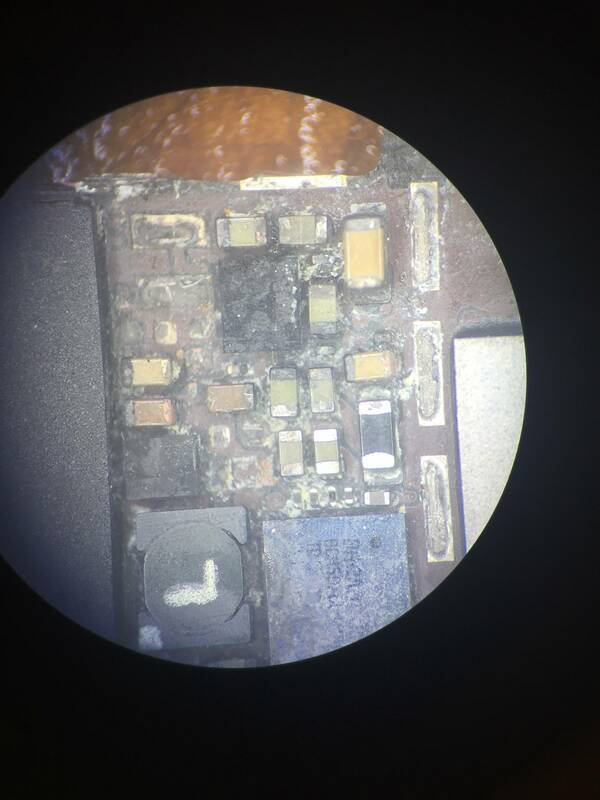 Even if the phone seems to be working, it will have oxidized solder joints that are weakened and brittle. Corrosion will continue to spread inside the phone. We have done nothing but experienced temporary luck. You have to take it to a repair shop that has an ultrasonic cleaner or follow the advice from iFixit. What you want to do is first displace the water—or more specifically, all the conductive stuff in the water. You can do this best by using 90%+ isopropyl (rubbing) alcohol and a toothbrush. Open your device as soon as you can, take out the battery, and get scrubbing. Submerge the whole motherboard in alcohol, and scrub away. Only then, dry it and see where you stand. This is your best strategy for liquid damage. You'd be hard pressed to find any experienced professional in the repair industry that doesn't roll their eyes when they hear the word "rice." We see the sad result of phones/devices that have been carefully placed in the Mahatma bag with fingers crossed. How is rice supposed to remove this damage? Imagine even rubbing the rice on the circuit board. Would that do anything? NO. So that's why putting your phone in a bag of rice would NOT help. Not the answer you're looking for? Browse other questions tagged water-damage or ask your own question. What are my options to recover data from my water damaged phone? How can I view online all of my phone contacts that Android synced to my google account? Android phone water damage or changed setting?